Jesters Moon hail from Portland, Oregon in the Pacific Northwest region of the USA. As the band puts it, they play "no nu-metal, no rap-metal, no alt-metal! Just Heavy Metal." They don't declare themselves the next prophets of heavy metal, nor do they make lofty comparisons to the giants of the genre. Simply put, these guys love classic metal of the 80's, and they're here to keep the spirit of heavy metal alive and well. The band is playing a brand of heavy metal that is derived straight from the 1980's. From the opening track, The Battle, one may think that this is going to be a US power metal album. Not the case. Aside from the first track, Jesters Moon deliver a nice slab of hard rock and heavy metal with a slight Black Sabbath like dark vibe. The band's biggest strength is the guitar work. The solos are flat out excellent, while galloping, catchy riffs (ala Saxon, Accept, and underrated Shok Paris) dominate the album. The songs are well structured with no filler material to be found. Those of you who remember Wild Dogs will want to pay special attention to the powerful and catchy No Clue, which is a duet with Wild Dogs' vocalist Matt McCourt. The progressive tinged Amnesia clocks in at around ten minutes, yet doesn't bore you to death like a ten minute Axel Rudi Pell ballad (sorry, back to topic now….). Jesters Moon really showcases their songwriting ability with this song. This atmospheric track features some nice guitar work, some intricate drum work, and of course some jamming guitar work. However, the solos are nicely placed as to not dominate. The song ends calmly with a piano part and crashing waves in the background. Destination Known contains some cool synth layers that make for a very eerie and ominous atmosphere. 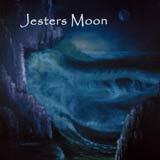 It is safe to say that Jesters Moon is not just some predictable 80's copycat band. They are a multidimensional band as far as songwriting goes, that's for sure. Their songs are based on strong guitar work, yet they throw in enough surprises to keep the listener interested. As far as the weak link of the band, the lead vocals are the biggest concern for me. Bryce van Patten (lead vocals / guitars / keyboards) has a limited range, and sounds like a strange hybrid of Biff Byford (Saxon) and UDO. I got used to his voice after a couple listens, but I'd like to hear him use his voice more effectively in the future. The production is satisfactory for a self financed release, although a bit muddy (especially the drums). The overall strengths of this album certainly outweigh the weaknesses. Jesters Moon should be able to secure a contract with this album. With the guidance and financial support of a label, I expect this band only to get better. The lead vocalist will have to improve (or maybe stay on guitars and bring in a fifth member to handle the vocals), but the musical content is very satisfying at this point. Classic 80's heavy metal fans should keep an eye on this band.